The sport of ATV riding is lucky to have networks of trails in place across North America that have been around for decades. The only downside is that many of these trail systems were developed for ATVs originally, and were done so before UTVs were anything more than a useful tool around the farm and worksite. When recreational UTVs really took off, those networks of trail systems that travel through some of the most scenic places on the earth were off limits. Why, you ask? 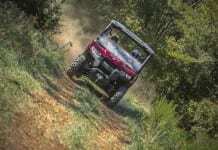 You know the answer – Most UTVs are far too wide to travel on these restricted trails. 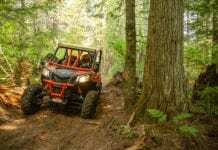 Polaris, Textron Off Road (the former Arctic Cat), and Honda have recreational machines designed to fit these narrow 50-inch maximum trails, but one player was conspicuously absent from the segment – Can-Am. That changed with the recent introduction of the all-new 2018 Maverick Trail. 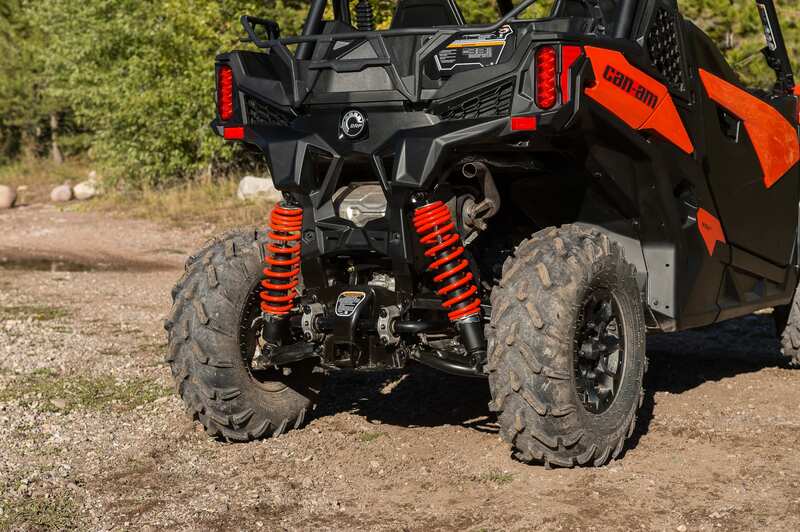 Can-Am is a company that doesn’t rush to a market, so while the competition held firm ground in the 50-inch category, Can-Am worked on a project to come into the segment with a splash. After spending some time behind the wheel of the new Trail, it is safe to say that Can-Am didn’t make a splash, they set off a tidal wave. 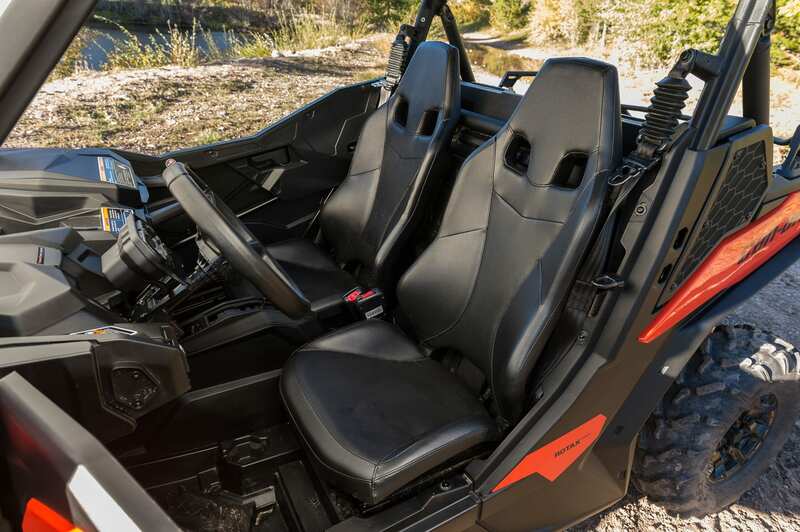 Can-Am didn’t come to market with just one version of the Maverick Trail. They actually have two, more if you count the power steering and non-power steering equipped versions. There are two engine platforms to choose from. The Maverick trail 800 has a 51 horsepower 799.9cc Rotax V-twin that does a great job of propelling the machine down the trail. But this is Can-Am, a company known to bring the power, right? Our favorite is the 75 horsepower 976cc Rotax V-twin that makes the Mav a trail screamer. 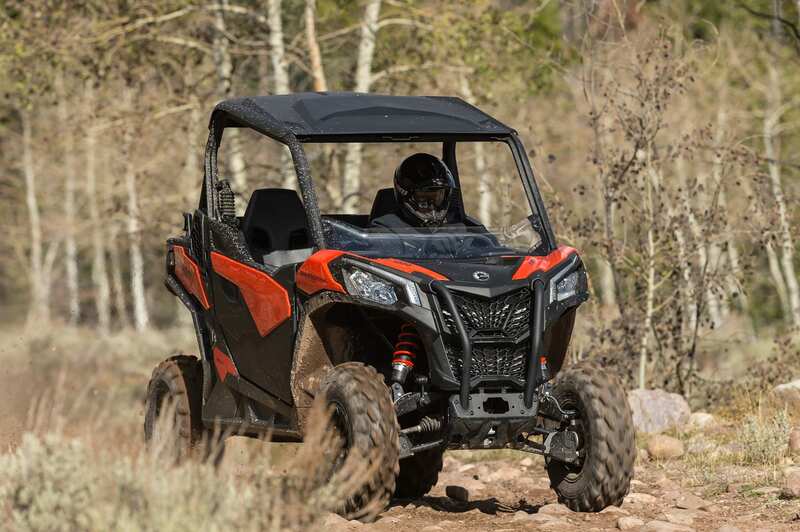 Each model has Can-Am’s drive-by-wire digital throttle for excellent response and control. This system helps give the Maverick excellent trail manners, especially in tighter, technical terrain. We took our Trail up past the 12,000-foot mark on a mountain with tricky rock sections, tight switchbacks, mud, snow, wind and cold. It was a steady drive all the way up and back down again. 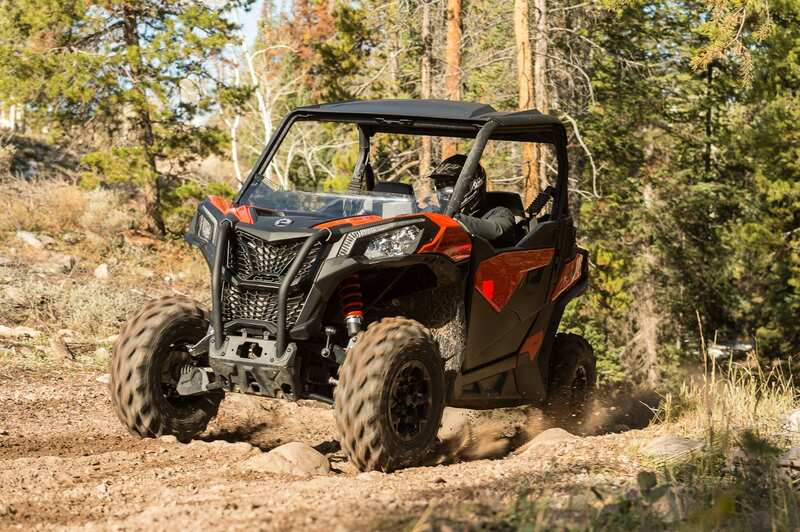 The transmission is Can-Am’s Quick Response System CVT with an extra low range design for extreme terrain. They added their electronic descent control engine braking platform, so between the extra low range and the engine braking, you have optimal control whether you’re going up or coming back down. The whole idea is to provide the driver and passenger with the upmost confidence and once again, Can-Am succeeded. The systems let you push yourself a little knowing that the machine can handle it. This makes it a ton of fun to drive. That’s not an optical illusion. 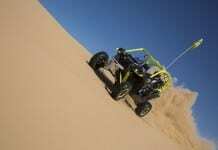 Can-Am designed the Maverick trail to be long, and from there, they moved the wheels out to the extreme edge. This gives the Trail a 90.6-inch wheelbase. This wheelbase allows for tight handling while still providing a stabile ride. 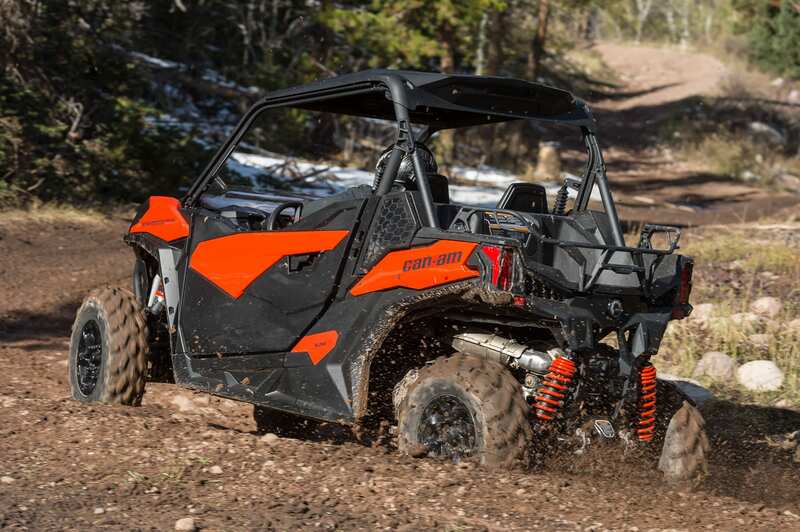 This gives the Can-Am Maverick Trail a 90.6-inch wheelbase. If you think there’s some styling borrowed from the big X3 machines, you’re right. There’s also a lot of technology and things Can-AM learned from the X3 platform. If you’ve ever had the opportunity to blast down a rough trail in an X3, you know it soaks up every bit of nastiness the terrain can dish out. But the X3 is not a tight terrain kind of ride. The Trail is designed for those tighter trails, but much like it’s big brother, the Maverick Trail will let you hammer through some pretty rough stuff and track straight and true. The more aggressive you drive, the better it seemed to take it, and that says a lot. This is a machine that starts out really good and just seems to get better as the trail and terrain gets worse. That alone ought to make you want to go out and at least try one out. One thing to note. With the wheels moved out to the corners as they are to boost wheelbase, it does create a small, and we mean very small, issue to be aware of. If you’re riding in muddy terrain, don’t have gear in the cargo area that isn’t protected. The meaty, 26-inch Carlisle ACT tires work great at grabbing traction, but they’ll also fling a lot of muck into the cargo area of the machine. You’ll also notice with the wheelbase as it is, that the rear shocks mounted on the torsional trailing arm system are right at the back of the machine. These big shocks offer up 10.5 inches of travel and do an excellent job soaking up bumps and jolts along the trail. Up front there are dual A-arms with 10 inches of travel to the shocks. These big shocks offer up 10.5 inches of travel and do an excellent job soaking up bumps and jolts along the trail. Beefy sway bars at both ends add to the solid and secure feel of the handling of the machine. One of the concerns we had going in was, with the longer wheelbase, would the machine feel some body roll going hard into a corner. Thanks to the sway bars, the answer is no. Allow us to repeat ourselves a little more here. The suspension, much like the rest of the machine, seemed to handle very well at slow speeds, but again, it really shined as speeds increased and obstacles grew more challenging. There’s a decent amount of storage inside the cab, with glove boxes on both the driver’s and passenger sides. And there are cup holders too. The 1000 models have full half doors, which did a great job keeping the slop out. For guys like us with wider shoulders, notice we didn’t old and fat, that means your left arm will hang over the top of the door much of the time. Just remember to tuck those elbows in if the trail you’re on is right at the 50-inch wide mark. We’re not saying we bumped our elbows on a tree, but we’re not, not saying it either. There’s a decent amount of storage inside the cab, with glove boxes on both the driver’s and passenger sides. And there are cup holders too. The glove boxes aren’t huge, but will hold your phone, and other stuff. The rear cargo area will hold up to 300-pounds of gear, and if you really need more, there is a 2-inch receiver hitch and 1,500-pounds of towing capacity. Of course you need one. But which one do you get? The non-power steering models come in the 800 and 1000 and start out around $10,999 for the 800. The Dynamic Power Steering model jumps up another $2000. Now, we’re going to recommend the DPS system, of course. The non-power steering machine is still very good, and a great option for those concerned with price. You do get a lot of great machine for the money, even at the lowest price-point. This is a purpose-build performer that handles extremely well, and is an extreme amount of fun to drive. 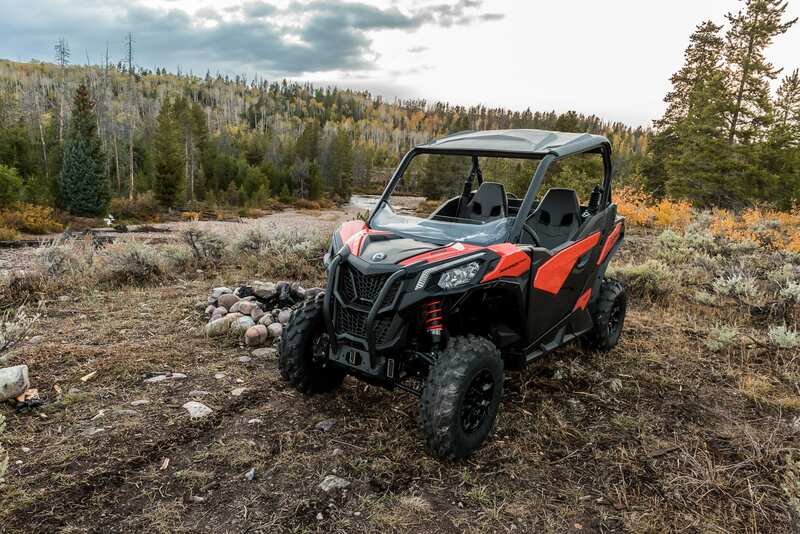 Like they always do, Can-Am waited to enter a segment of the market with a machine that right away impresses and put the competition on notice. This is not just a narrow version of a different machine from the Can-Am lineup. This is a purpose-build performer that handles extremely well, and is an extreme amount of fun to drive. It gives you a new option for blasting down those trails that might have been closed to you previously, and now you can take a passenger. Honestly, we don’t think of the 2018 Maverick Trail as a machine we’d just use for 50-inch trails. We’d take it anywhere and have a really good time while we’re at it. Check one out for yourself. You’ll be happy you did.